Birthday parties are available during Didier Farms’ Pumpkinfest only – end of September to Halloween. Birthday Parties are offered weekdays and weekends with four heated birthday rooms available. Corporate Parties or Large Group Gatherings- please click here for information. Click here for more information on 2018 Hayride Kid birthday parties download. Reservations begin on August 1st at 9:00 am. In Person or Call. Contact by phone at 224-543-9003. All Reservations will be taken Monday through Friday, 9:00 am – 2:00 pm. Reservations will not be taken before the first of August. If possible, have 1st, 2nd, and 3rd choices on times and dates for the birthday party. There is a non-refundable room fee that holds your room. Room fees must be received after making your reservation or your date will be canceled. A room will be reserved for 2 hour slots. You may arrive 15 minutes prior to your party to set up and you must vacate the room by the end of your 2 hours. There is a PARTY ZONE PARKING for one car per party, on the East side of the Barn. 2 HOUR PARKING ONLY. Weekday Price per child differs from Saturday, Sunday, & Columbus Day. Minimum 12 children. Maximum of 25 children and only 40 people per room. Only one adult per child included in price. All children must be paid for and included in your group’s rate. Infants under one-year-old are free unless the parent wants them to receive a pumpkin. 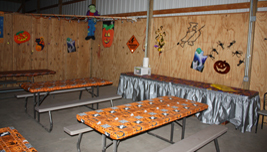 Your party package includes one adult per child for the hayride and/or corn maze. The hayride does not stop in the field. Additional adults wishing to go on the hayride or cornmaze are $5.00 per adult. (No adults receive a pumpkin ). If an adult picks a pumpkin, the adult must pay for the pumpkin in the farmstand by the pound price. Remember, your visit is not a guided tour. All parents or supervisors are responsible for the children in the party and any gifts or belongings in the party room. The room fee is paid in advance to hold your reservation and not deducted from your bill. Food Packages are available from our Pumpkin Patch Cafe. You are welcome to bring your own food and/or cake. Delivery from other places is acceptable. We can refrigerate items for you. NO piñatas, No Smoking, NO Alcoholic Beverages, and NO Stereos are permitted! We do not allow paints, markers or glues to be used in decorating Pumpkins. Stickers are allowed.